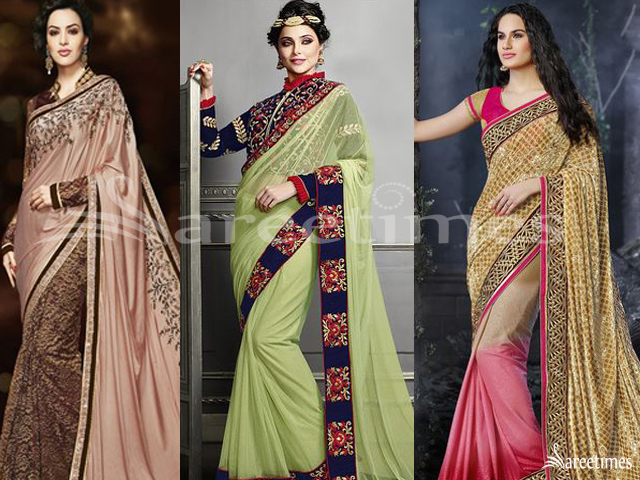 Beige embroidered sarees collection by Mahotsav. 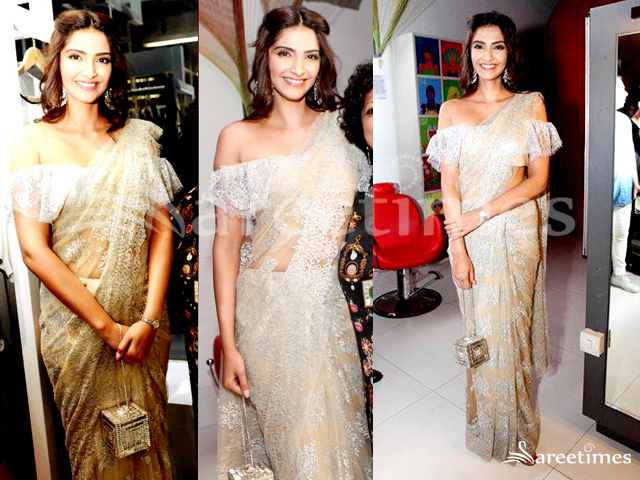 Sonam Kapoor was the guest of honour at Ambika Pilliai's store launch in Delhi. 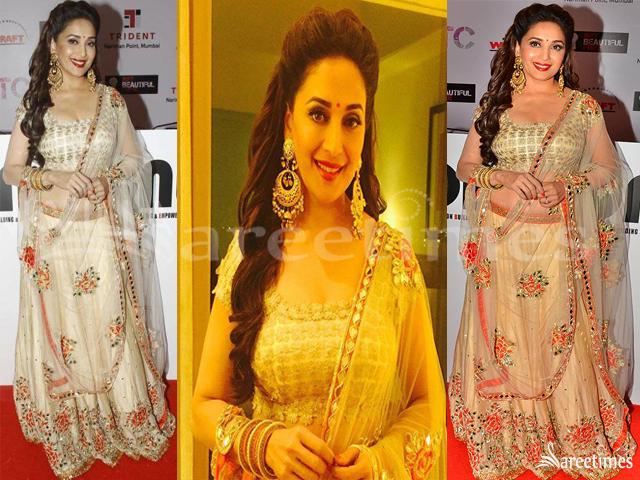 She was wearing a chantilly beige color lace saree by BFF and designer Shehla Khan, paired with a ruffled, off shoulder blouse. 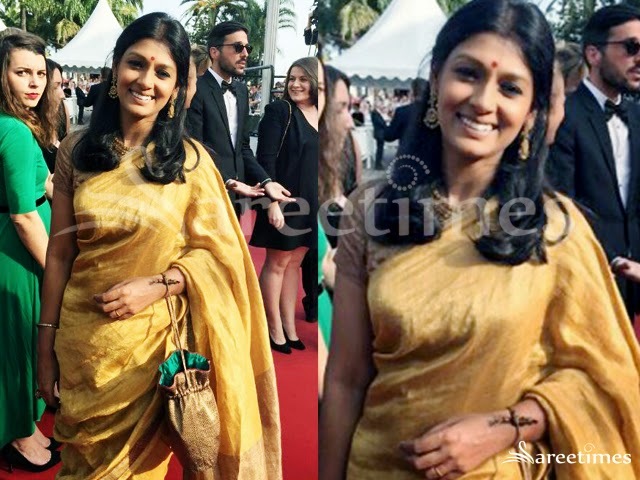 Nandita Das at 68th Annual Cannes Film Festival opening ceremony in designer Anavila saree. 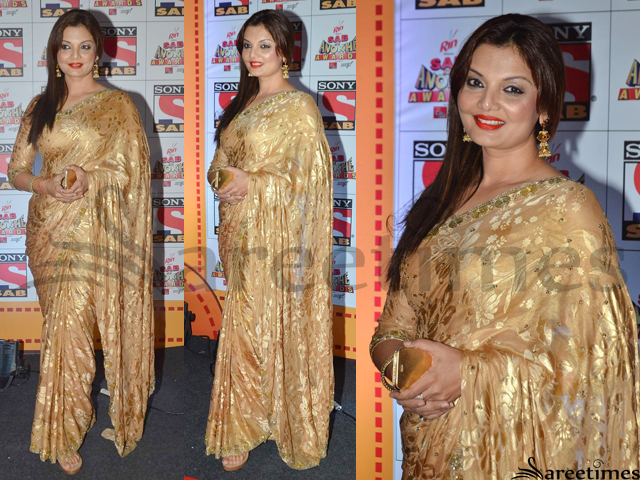 Gold color saree teamed with beige short sleeves blouse. 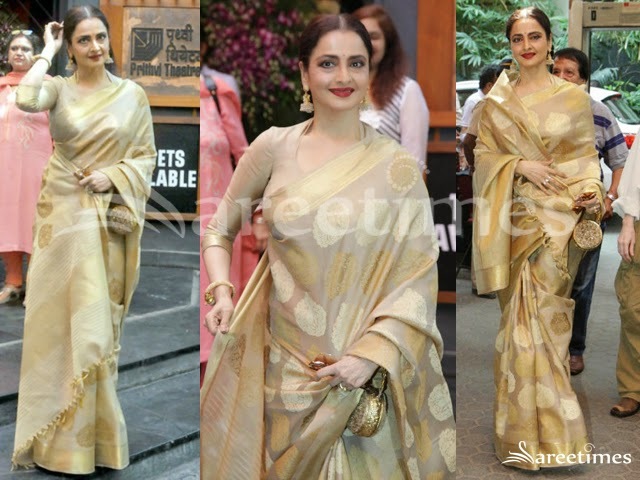 Rekha at Dadasaheb Phalke Award Presentation in beige color kanjeevaram chanderi saree paired with matching quarter sleeves high neck blouse. 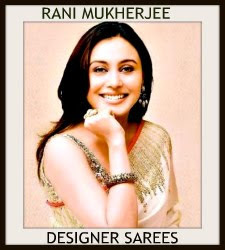 Model displaying plain lace saree in floral design designed by Raghuvendra Rathore at Blender’s pride Fashion Tour 2012. 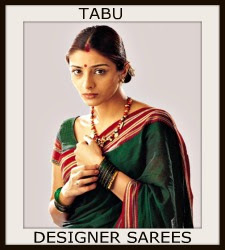 The sareeis teamed with lace border in matching color. It is paired with matching blouse. 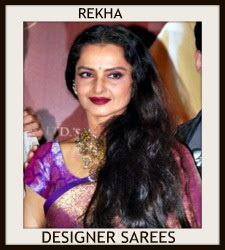 Shane Falguni Peacock showcased their beige color saree in net material at Blender’s pride fashion tour 2012. The applique work in large floral pattern along the border in self color is impressive. 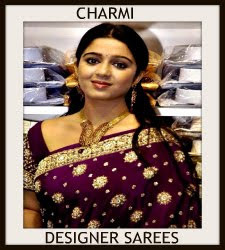 It is paired with silver color blouse in mega sleeves with unique pattern along the midrib attaching the blouse and the saree. 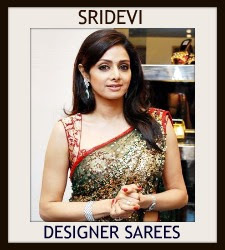 South Indian and bollywood actress sareedevi in royal beige color Sabyasachi saree. 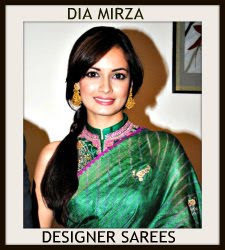 The plain saree with black and white embroidered floral ribbon border looks very elegant. 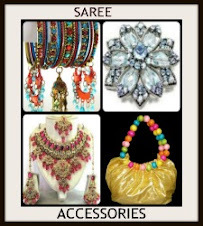 It is paired with heavy collar neck blouse with heavy embroidery around the neck and full sleeves in contrasting green color. 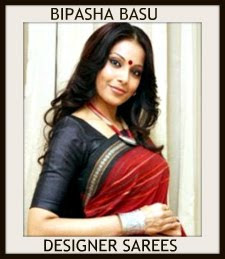 She was seen in this Sabyasachi saree on the sets of KBC. 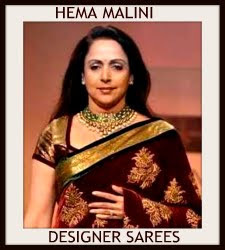 Bollywood actress Poonam Dhillon in beige color designer saree with embroidered patch work border in black and silver beeds along with silver buttie work all over. 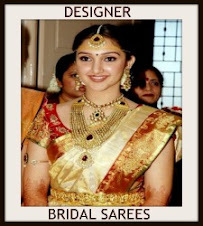 It is paired with heavy embroidered sleeveless blouse at Taneesha Verma and Bappa Lahari marriage reception. Bollywood actress Lara Dutta in designer ombre saree in beige at Anmol jeweller’s 25th anniversary function. 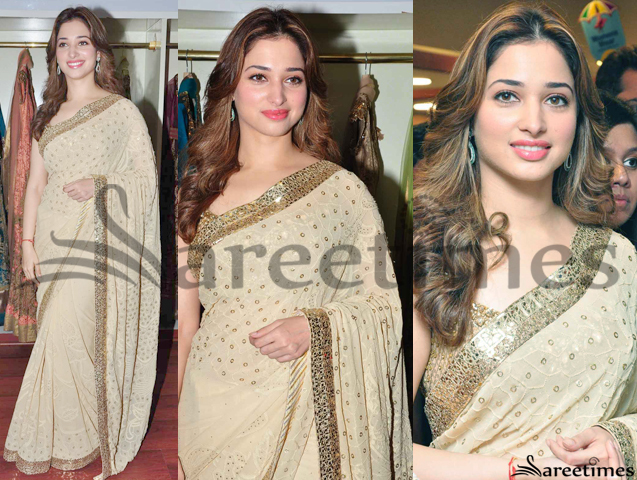 The flowing material with a fine lace border and adds grace to it. It is piredwith designer sleevless blouse in chikankari work. 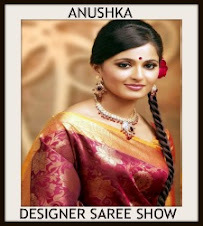 Model displaying beige color designer saree for Chivas studio show designed by Manish Malhotra. The half and half combination of plain and design in velvet along with the velvet mustard border gives it a unique look. 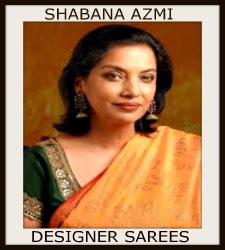 It is paired with designer sleevless saree blouse in checkered pattern.